Can you display a small poster to help to advertise our Aikido Club? If you know of somewhere - a shop, pub, community centre or sports centre, even just a window of your house - where you could display an A4 poster, we would be really grateful. The Hartland Aikido Club is a non-profit-making community group which is supported by Torridge Council and the Active Villages initiative. It is worth mentioning this fact when asking people to display a poster just in case they think we are a big commercial organisation! You can download and print a PDF-format copy of our poster either for black-and-white or colour printing. 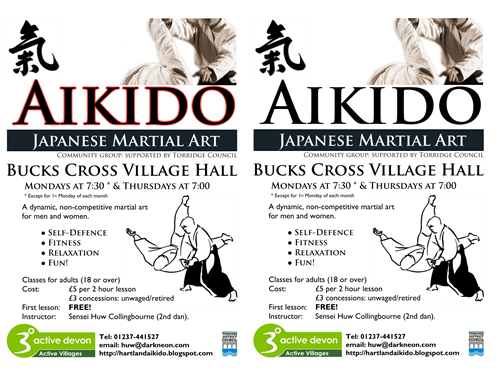 The two versions are similar but the colour one highlights the word 'Aikido' in red to add a bit more impact. Click HERE to download the colour poster. Click HERE to download the black-and-white poster. To download the posters, click a link above and then click the small down-arrw at the top-left of the page.